Over the course of our year here, I will challenge myself (if I remember to do so) to tell stories about South Africa in six words. Or, at least I will try to describe South Africa in six words. I’m no Hemingway. Big Five, bigger issues, biggest hearts. Legacy shed, we are looking forward. Quirky, mixed-race teenager seeks worldwide attention. Rainbow Nation, you can do this! Brus, braais, Boks and Bafana Bafana. What story can you tell in six words? What six words do you have for us? What’s your six-word memoir? Planes fly. Board one. Get here. Loyal fans of the TV drama Lost are intimately familiar with the concept of “the constant.” In the episode of the same name, Desmond begins to travel back and forth in time and worries that the time warps may kill him until, as a young Daniel Faraday instructs, he finds a constant – something or someone present in both times that can be an anchor. For Desmond, that constant turns out to be the lovely Penny. For us, the time warps are not nearly as dramatic or dangerous (no headaches or nosebleeds), but it seems important to find a constant, nevertheless. The flashbacks and flash-forwards (Hoffs/Drawlar, anyone?) began soon after we arrived. One moment we’d see a street full of BMWs, Audis and Mercedes, and the next moment we’d see a woman carrying a basket on her head. One minute we’d be discussing advances in South African higher education, and the next minute we’d learn about kids outside Pretoria who don’t even have a school to attend. One day we’d be in the Rainbow Nation, the next day we’d be in a country filled with racist violence. It’s a daily dichotomy. Signs of modernity clash with evidence of the past everywhere we look. Then, it hit me. We’ve been through this before, in other travels. In Nepal, where barefoot porters strap loads of Pringles and Spanish beer to their backs and deliver them to tiny mountain villages, and yaks wander carefree past internet cafes. In Morocco, where donkeys pull carts stacked with recently tanned hides through souks selling the latest Hollywood DVDs and brightly colored plastic cell phone cases. The constant, the thing present in all of these places that could anchor us in time – as transitory a time as it may be – was orange peels. 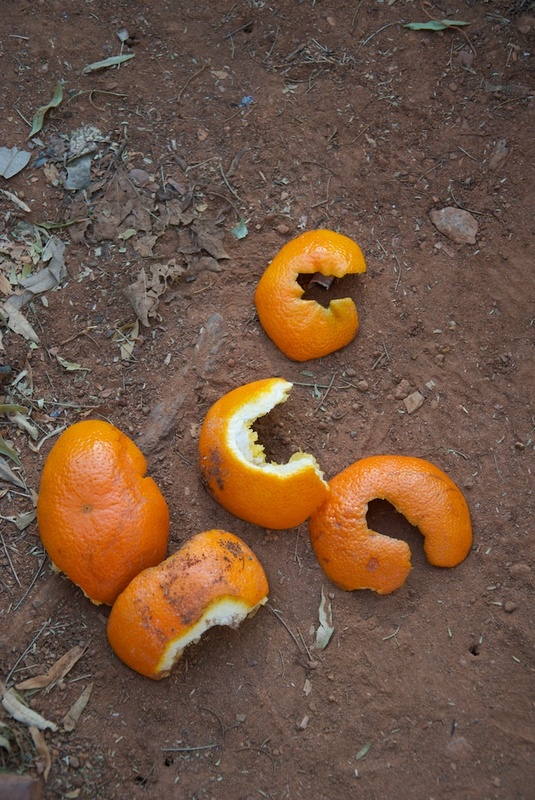 Simple, organic and innocent orange peels. They are everywhere. Just as they are found in the swept streets of Thamel and the rocky trails of the High Atlas, they are here, too – on the lawn outside security gates, in the middle of roundabouts, between the cobblestones at the entrances to malls. So now that we have our constant, will we be firmly anchored or will we continue to experience such temporal dissonance? Is it a cop-out to say that only time will tell?